Photo credit: API Equality – Northern California. November 20th marks the annual Trans Day of Remembrance (#TDoR), a day founded in 1998 in memoriam and celebration of the trans and gender nonconforming people who have fought, passed, and endured in a society that does not consistently value and affirm their lives. This week, we honored the breadth of our thriving Asian Pacific Islander trans community. 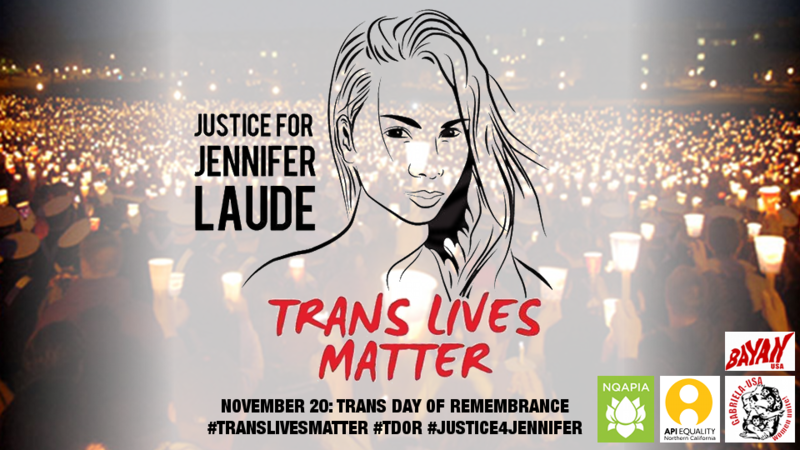 This week, we remembered Jennifer Laude, a trans Filipina woman who was murdered one month ago by U.S. Marine Joseph Scott Pemberton. This week, we are watching and waiting for the grand jury of Ferguson to announce their decision on the indictment of police officer Darren Wilson for the murder of Mike Brown. Those last two things are inextricably and tragically linked. While Jennifer Laude was murdered in Olongapo City in the Philippines and Mike Brown was killed in Ferguson, Missouri, they are connected as two victims in a brutal and pervasive system—one that perpetuates gender-based violence, militarization of our police force, U.S. imperialism of the Asia-Pacific, and the criminalization and containment of Black lives and bodies. It is not an accident or a coincidence that we are mourning the unjust and undignified loss of a young black man at home and a transgender Filipina woman abroad, both of whom died at the hands of members of U.S. militarized forces. Photo credit: BlackLivesMatter Facebook Page. Add to this mix that today we await President Obama’s unveiling of his executive action on immigration, which could potentially protect millions of undocumented immigrants from detention and deportation. And while we celebrate that many of our community members and allies may receive some relief, we also recognize that what these undocumented immigrants and their families have in common with Jennifer Laude and Mike Brown is that they, too, suffer the consequences of these systems that do not value black, brown, trans, immigrant, poor, queer, or sick and disabled bodies. As queer API people, we don’t lead single issue lives. Moments of loss and celebration are a reminder that even as we work for reform, we know we deserve more. Our massive, sprawling, multifaceted communities are fighting, living, and loving for justice and liberation. We are done waiting. Today, API Equality – Northern California honors in particular the vitality and struggles of trans women of color, of Black men, and of immigrants, without whom our liberation would be impossible. We stay committed to uniting our queer and trans Asian and Pacific Islander community to combat systemic oppression and violence. We commit to understanding our roles within these systems so that we can learn how to act in true solidarity and interdependence. Everyday, we will build power in memory of Jennifer Laude, Mike Brown, and those who have fallen.